In a last ditch effort to save the building from demolition F.I.S.H. and CVHS acquired the Burton Store, the first commercial building erected by pioneer settlers in the Village of Cortez. 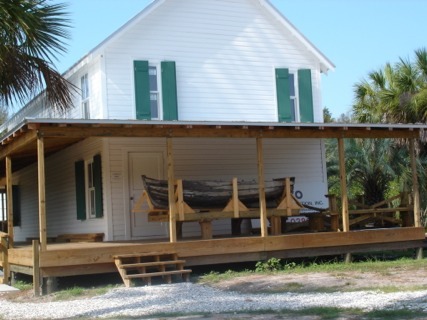 In 1890 the building served as a store, post office, community gathering place, and dock connecting the isolated fishing families with the outside world. On Oct. 18th., and funded in part by a grant from the William G. Selby and Marie Selby Foundation of Sarasota, Florida the building was moved to its new foundation next to the 1912 Cortez School house for a complete renovation. Additional funding provided by Manatee County Board of County Commissioners and the Manatee County Planning Department through a Community Development Block Grant was used to stabilize the historic building. From the Burton Store's completed classroom and fully restored front porch trails and raised walkways with interpretive signage at strategic stations will extend across a foot bridge and out like a fisherman's net into the full array of coastal habitat included within the adjacent Preserve's boundaries. Programs will take place in the building's classroom and small research library that enlighten visitors thoroughly about the chain of environmental and cultural events that must take place between the coastal hammock and uplands, through critical wetlands and tidal streams, into our shallow bays and estuaries, through inlets out to the gulf and, finally, back in the form of seafood on our tables. This all inclusive life cycle is to be presented in hopes that a now enlightened audience will appreciate the value of coastal habitat and the commercial fisherman who form the symbiotic relationship that has sustained and nourished us for hundreds of years. Other programs, classes and events, held at our annual Commercial Fishing festival, Historic Homes Tour, and in our traditional wooden boat shop, are already providing a forum where traditional skills such as boat building and repair, net mending and making, and fishing are passed from the hands of senior practitioners to the next generation. Just as the buildings will serve as places where personal links will be developed to help participants understand the value of Cortez and other traditional maritime communities those programs will be done in the natural context where the Preserve will serve as a special place for an understanding and direct personal linkage between our visitors and the diverse habitat of our coastal ecosystems to be developed.